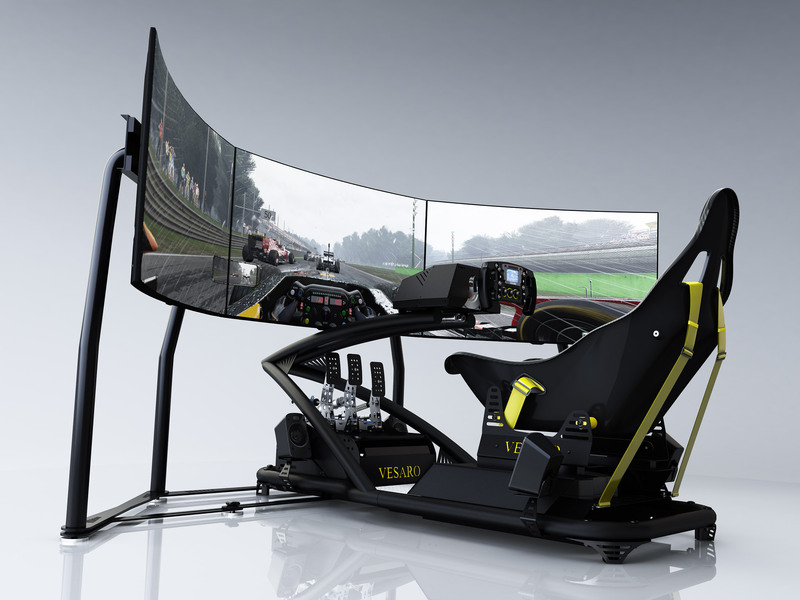 Vesaro I Formula Professional simulator designed for private or home customers requiring high end Motorsport grade components for personal race driver training or home enthusiasts who require the highest standard components. Featuring our formula style driving position which utilizes a professional carbon fibre/GRP Tillet formula bucket racing seat. The simulator comes Plug and Play factory assembled by default and includes a professional grade direct drive steering force feedback system, designed for the ultimate in authenticity and realism and offering direct feedback of the cars steering system, road texture and general forces. The simulator includes our custom built watercooled PC which uses only the best cherry picked components for optimal simulation performance. All Vesaro PC's are built in house by the same technicians building the simulator ensuring that everything seamlessly ties together for a complete unified solution. Based on our commercial strength framework with adjustable pedal height and position using a quick release system and featuring adjustable seat position and adjustable height and angle. On-board audio provides a clean setup with high quality on board components including an Alpine low profile subwoofer located under the seat and a vibe amplifier powering the 4 satellite speakers. The simulator uses our modular architechure allowing full upgradability or change of function from formula to GT or rally style setups should you require. The simulator includes our top of the range Pro Controls V-Spec Formula Extreme wheel rim, a professional wheel rim with integrated colour display, designed for professional use and for customers requiring the highest quality materials, authentic feeling and features to suit the most demanding simulation application requirements. This is combined with our direct drive force feedback wheel systems which provide industrial grade strength and ultra fast response, accurately recreating the steering forces, road surface texture and tyre feeling through the wheel. The Simulator comes with a 2 Year warranty and is backed up by our free remote login support and 7 days per week phone and email support.